As part of our Railway Upgrade Plan we are investing in the East Coast Main Line (ECML) to allow more and faster services to run. Spanning 12 counties, the iconic 393 mile long ECML will soon be home to the new InterCity Express Programme trains which will allow more passengers to travel on each service and have a higher top speed than existing rolling stock. Projects on the route will remove bottlenecks to make room for another long distance passenger train each hour whilst improving links to and through London - all while keeping freight on the rails and off our congested road network. As part of this programme we are working on plans to install six miles of new track on the east side of the railway between Huntingdon Station and Woodwalton. This work, known as the Huntingdon to Woodwalton Four Tracking scheme, will remove a critical bottleneck between London and the North, allowing fast trains to overtake slower ones, increasing the number of services which can run and improving reliability. 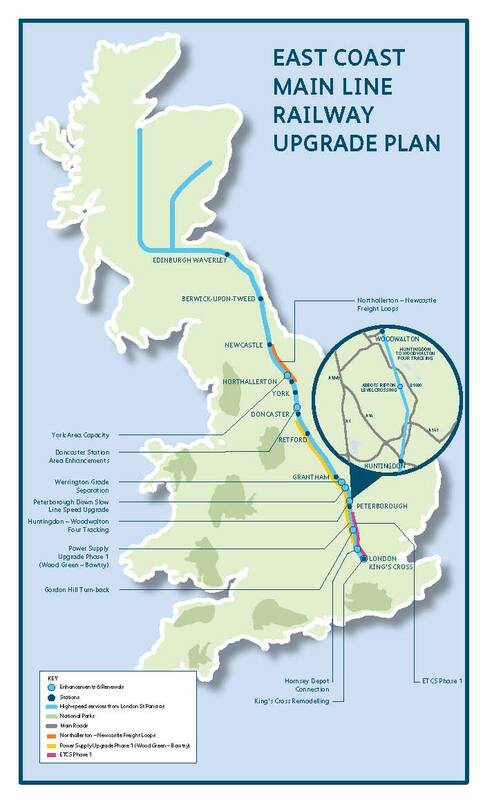 Above: The East Coast Main Line Railway Upgrade Plan. See link below to download high-res version of this map. The Huntingdon to Woodwalton Four Tracking scheme will take place between Huntingdon and Woodwalton in Cambridgeshire, England. Options for increasing capacity on this stretch of the ECML have been considered and we are now consulting on a draft scheme. 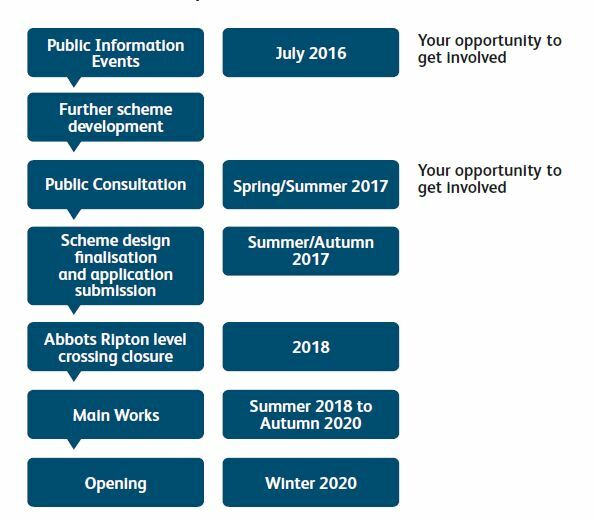 Once the design for the scheme has been finalised, construction is expected to start in 2018 and last until 2020. Before drawing up detailed plans for the scheme we are providing our neighbours and stakeholders with the opportunity to learn about the scheme and to help shape it. Your views are important to us. If you haven't already filled in one of our response forms then please take the time to complete the online version at the link below. Please submit your response by 23 July 2016 so we have adequate time to consider your comments.